Marilyn Saulsbury received a Bachelor of Science in Pharmacy from Xavier University of Louisiana College of Pharmacy. She is a registered pharmacist who has licensure to practice pharmacy in Virginia. Dr. Saulsbury graduated from Meharry Medical College - School of Graduate Studies and Research where she completed her studies and acquired a Doctor of Philosophy degree from the Department of Pharmacology. Dr. Saulsbury lectures several content areas within the discipline of Health and Basic Medical Sciences at Hampton University including Pharmacology, Physical Therapy Pharmacology, Nursing Pharmacotherapy, Pathophysiology, Physiology and Health Disparities. Along with an active teaching and service schedule she is a grant-writer and biomedical researcher. She has been the PI and/ or Co-PI of four (4) investigator-initiated awards from National Institutes of Health (including MBRS-SCORE, MIDARP, NCI-P20 grants) and the Centers for Disease Control-Agency for Toxic Substance and Disease Registry totaling approximately five (5) million dollars. She has written and served as co-author to peer-reviewed research articles. Dr. Saulsbury's current research interests include the determination of plausible mechanisms by which broad spectrum organophosphate insecticides (organochlorines) alter the expression of gonadotropic releasing hormone (GnRH) and interfere with the normal functions of the hypothalamic-pituitary-gonadal axis (the sytem that integrates the nervous and reproductive system). 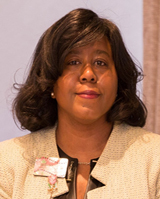 Her professional organization membership includes the Southeastern Pharmacology Society (SEPS), Virginia Pharmacists Association (VPhA), the American Association of Pharmaceutical Scientists (AAPS) and the Consortium of Doctors, Ltd. (COD).